As a five-year-old, my younger daughter made, what seemed to me, an unusual request. She started asking for a globe to keep in her room. I’m not sure what prompted this request, but when we found an inexpensive one at a Goodwill store, I bought it for her. However, that one didn’t last very long before it had to be discarded. I thought the time for having a globe might have passed, but she would still mention from time to time that she wanted one. So my parents bought her this one last Christmas. My daughter was thrilled when she opened the present! It sits atop one of the girls’ bookcases in our hallway and has certainly come in handy. When we did our summer learning program, we used it to find the location of the countries we were studying. It’s also great for my older daughter who is currently learning about such things as the equator and the Prime Meridian in school. (It’s amazing how much of that stuff comes back from my own school days as I look over her notes and help her study! )Asking for a globe at such a young age still strikes me as a bit unconventional, but it fulfilled her desire. This globe, which should last for many years, will remind me of what unique individuals our children are. Visit Show and Tell Friday at There’s No Place Like Home to see what others are showcasing from their homes.Don’t miss a post at Girls to Grow! Click here to subscribe in a feed reader. Its good to have a globe. It will help yr daughter to gain more knowledge from it. Have a nice weekend. Globe very useful item.. I think I need to get one.. at least smaller size.. have a great weekend! safe places online Bee questions too! Great Globe! That's terrific. I'd like one as a decorative thing, but sounds like her request is for knowledge! Please stop by The Old Parsonage if you have the time. 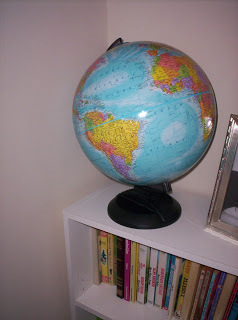 One of my daughters wanted a globe when she was younger, the globes that talk and you play games on to find countries and such. She got it for Christmas one year. We still have it almost 10 years later and all the kids have loved it.